Inveterate traveller since her earliest wanderings, Luisa Futoransky draws from a deep well. A long-distance poet, she listens to the world with the instincts of a diviner, ready to cull its ineffable moments and render them in a few lines where they will bloom again. Like a Chinese ink painter, with the merest of means and a free hand she sketches ancient histories, migrations, tales of hope and heartbreak, and word by word—exact, deliberate, chosen words—brings us to the point of insight. Her poems stand us upright somehow amid the dizzying swirl of existence, even as they reflect the many places she has known. I first met Luisa soon after she landed in Paris some 35 years ago, where she still lives. Often I marvelled at how she got along: not that poetry meant a vow of poverty, not quite, but from her modest employments, the occasional grants and invitations, the humble abode that was her home, she learned to spin a kind of gold; richer than gold, more enduring, made with just what was at hand, small nothings, words. It took me a long time to appreciate the distillation that was going on. Her erudition, then as now, she wore lightly and the humour with which she faced every reversal and revelation had a seasoned quality that seemed well earned. But where did she come from, and how did she gain such fluency with the ways of the world? Born and raised in Buenos Aires, from an Eastern European Jewish immigrant family, she studied music and literature and received her law degree from the university there. During the 1960s, after working under Borges at the national library, she travelled extensively throughout Latin America and left Argentina permanently in 1971, when she was a guest at the Iowa Writers Workshop. Following that, she lived in Spain and Rome, with several visits to Israel, and for four years taught opera in Japan. In the late 1970s, she moved to Beijing, working in the Spanish language bureau of the Chinese state radio. From there, in 1981, she moved to Paris. For most of her first dozen years in Paris, she worked as an art museum guard at the Centre Pompidou. Eventually she found a position at the Agence France Presse, part of a venerable tradition among Latin American writers in Paris. Another decade and a half, she reached mandatory retirement age, though she continues to write, edit, and translate for UNESCO’s magazine. And all the while, of course, every couple of years, SAMPLER 7 she published another book. Next year, her publisher in Buenos Aires, Leviatán, will bring out her collected poems, fifty-plus years after her first book. Luisa established herself initially as a poet with several books in the ’60s and ’70s. After settling in Paris she took up prose as well. Since then, five novels and two non-fiction books (on hair and honeymoons) have appeared, along with at least fifteen books of poetry. She is a poet of lived experience above all, though not hers alone; other voices inhabit the work, whether of friends, lovers, fellow travellers (people she met or figures from history and literature). Like the poetry, her fiction employs a direct language rooted in anecdote and reflection, while sometimes delighting in playful experimentalism. Hers are mosaic narratives, made of pieces, fragments. 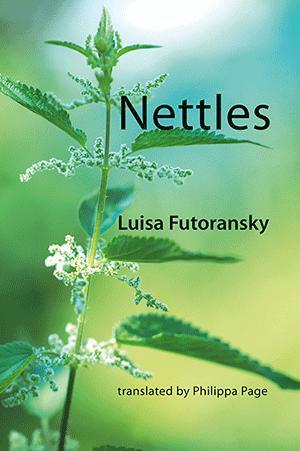 Something else to notice in Nettles is her flair for the theatrical, especially acute when she writes in shorter forms. Surely her studies of opera helped to hone her instinct for the dramatic gesture. But to think that we start in Rome with this book only to end up in Ohio. That is some sense of humour.